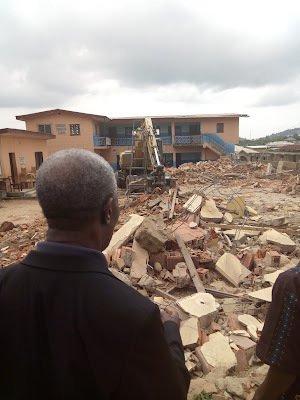 Mile Markers: The Re-building of The Church In Abeokuta Is Complete! 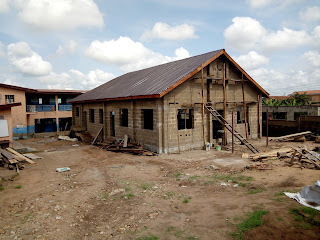 The Re-building of The Church In Abeokuta Is Complete! 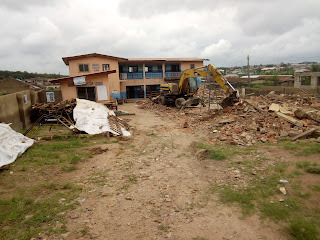 I first told you back in the summer about one of the churches in Abeokuta, Nigeria having to be demolished. They discovered it was very near collapse so it had to come down. This is one of Bro. Shobanke's branch churches. We have visited and preached in this building many times and it was very sad to see it coming down. It was sad for me, but much worse for the Pastors and people that gather to worship there every week. When they watched the building being taken down they had no guarantee it would be built again in a timely manner at all. We were able very quickly to send an offering with the help of churches and individuals and the work to rebuild was started right away. Others jumped on board and rapid progress of the construction was the result. Bro. Shobanke told me in late October that he intended to dedicate the church in early December but it seemed impossible to me. This past Saturday afternoon they dedicated the new church. It is completed and it is debt free! These are some of the best pictures that I received in our email. I am so happy that the church is completed and that there is no debt. I have talked to Bro. Shobanke twice since the dedication and to say that he is thrilled is an understatement to the extreme. He is praising God for the speedy re-building of the church with no debt and we are echoing that praise unto God as well. Bro. Shobanke says, "It is a miracle" and indeed it is! Thank you for praying for the congregation that meets in this building and the school children from GoodNews Christian School that use this building as well. Thank you to those who were able to send an offering too. May God bless each and every one of you for your kindness and thoughtfulness. It is amazing that most of you will never meet these children of God while we live on earth. Yet, you feel a kinship with them and a willingness to help them. That is because we are family. We are heirs of God and joint-heirs with Christ! Thank you, friends. Thank you from the bottom of my heart. Join us in praising God with our brothers and sisters in Nigeria! Praise God for His help!